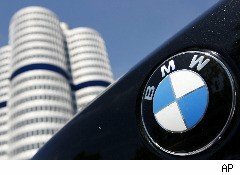 BMW, the German luxury car maker, reported Wednesday its third-quarter net profit soared and revenue surged on strong demand for luxury cars. "The broad recovery taking place in international car markets gives reason to believe that sales volumes will be significantly higher, particularly in emerging markets," the company said. And following Mercedes' move to increase its guidance, BMW also raised its 2010 outlook. BMW reported net income jumped to €874 million ($1.2 billion) from €78 million in the same period a year ago. Revenue rose 35.6% to €15.94 billion. Analysts polled by Dow Jones Newswires expected net profit of €784 million and revenue of €14.3 billion. Volume rose 13% as the company sold 366,190 units during the quarter, comprising 306,982 BMW (+16.3% growth), 58,450 Mini (–2.8%) and 758 Rolls­-Royce brand cars (compared to 132 units in 2009). Some new models did well: The new BMW 5 Series Sedan rose 22% in the first nine months. The BMW X1 is currently enjoying strong demand worldwide, the company said. The Mini Countryman is the fourth model in the Mini portfolio. The Rolls-Royce Ghost has been performing extremely well in its first year. BMW also increased its earnings forecast for the current financial year. "We forecast that the car sales volume will rise by more than 10% to over 1.4 million units for the full year and that the Automobiles segment will achieve an EBIT margin of above 7%," the company said. While this is an increase from a previous forecast for full-year EBIT margin of over 5% for the automobile segment, analysts said the guidance was low.